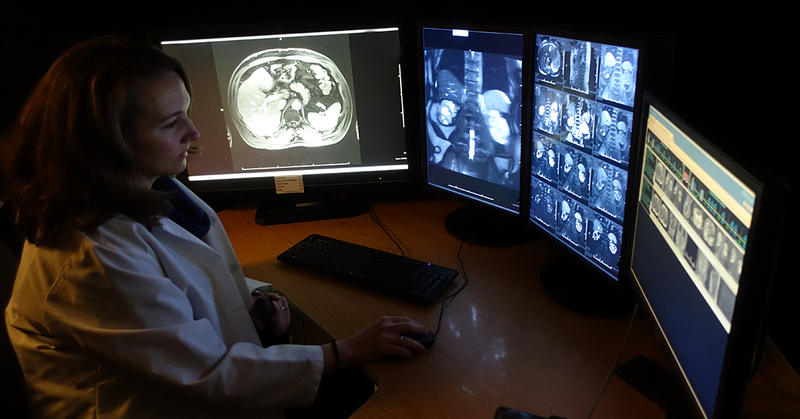 Jordan Anaokar, MD, a diagnostic radiologist at Fox Chase Cancer Center, reviews patient scans. Even if you’re already being treated at a dedicated cancer center like Fox Chase, it still might seem easier or more convenient to have your scans performed nearby at your community hospital. But there are important reasons why it’s best for your imaging to be done at the same place as your treatment. Rosaleen Parsons, MD, FACR, FSAR, Chair of Diagnostic Imaging at Fox Chase Cancer Center, shares reasons why it’s smart to have a dedicated “home” for your cancer scans—and why a comprehensive cancer center just might be the ideal place when you are dealing with cancer risk, diagnosis, and treatment. 1. You’ll have access to advanced imaging. NCI-designated Comprehensive Cancer Centers like Fox Chase use advanced technology to capture detailed and focused scans. Imaging protocols make a big difference, as well. For example, here at Fox Chase, we have specialized protocols for different body parts and conditions. With oncology imaging, one size does not fit all. We tailor our imaging exams based on each patient’s cancer type and treatment, which reduces errors in interpretation and aides the cancer treatment team in managing a patient’s disease. That’s why cancer radiologists are an essential part of your care team at comprehensive cancer centers like Fox Chase. 2. Radiologists at Fox Chase have extensive experience in the interpretation of cancer imaging studies, which is not always found at community hospitals. While a tumor or other obvious abnormality may be easy to spot for most radiologists, the radiologists at Fox Chase have specialized expertise in interpreting scans with thorough knowledge of tumor biology and effects of tumor treatment. This deep understanding of the total impact of the tumor and treatment improves the radiologist’s interpretation. This level of skill and experience is not typically found at community centers. 3. It can add up to more comprehensive care overall. A scan from one appointment offers a quick snapshot of your cancer at a given moment. To get the most accurate details about your progress, your radiologist needs to see the full picture of your cancer over time. This requires review of multiple past scans that might not be available at an outside facility. If your radiologist doesn’t look at these past scans, it could result in inappropriate changes to your treatment that may be unnecessary. Having all of your imaging done at the same specialty center over time makes that easier. Instead of worrying whether scans from your local hospital get sent to the right place, you can rest assured knowing that your cancer care team already has access to all of your imaging results. Simply put? It’s less work—for a better outcome. Learn more about why you should trust your imaging with the radiologists at Fox Chase.